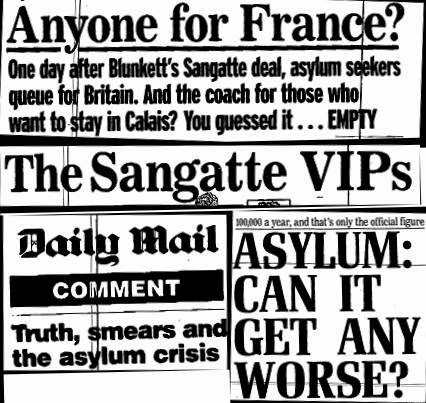 The controversy over the Mail's anti-Semitism began over the attack on Ed Miliband's father, Ralph Miliband, whom I once debated and knew from the Socialist Society. 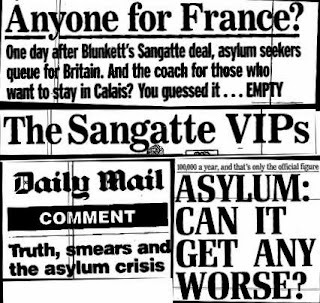 The idea that he 'hated' Britain is of course rubbish, but no doubt, like any socialist he hated the Britain of speculators, toffs, Cameroonians and privilege. In other words, ruling class Britain complete with its prejudices and bias. It is noticeable that in all her witterings, Melanie Phillips would have something to say about the newspaper which supported the anti-Semitic British Union of Fascists. 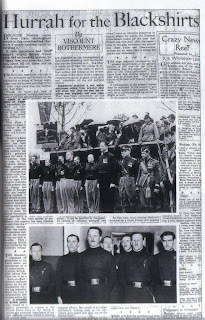 You might be fooled into thinking that the Daily Mail had an anti-fascist record as it attacks its opponents on the left as ‘fascists’. However the truth is a lot stranger. To dismiss the Miliband charges first. The fact that the article was written by Geoffrey Levy, who is Jewish, is irrelevant. Jews are as susceptible to the Mail Shilling as any one else. It is what he wrote that is important and this was a vicious attack on a Marxist Jewish refugee who fled Nazi Germany, served in the navy, but who hated the class nature of Britain and its iniquities, such as the fact that a tax-exile in France can try and sully the reputation of the late Ralph Miliband. It neatly conflates the fact of being Jewish and a refugee is to make one an 'enemy'. So yes, the article was anti-Semitic and Levy is a collaborator of the Zionist brand. ‘I WRITE from a new country on the map of Europe. Its name is Naziland. Of all the historic changes in our time, the transformation of Germany under Hitler has been the swiftest, most complete,’ which is certainly one way of putting it. Rothermere waxed lyrical about the attractions and support of German people for Hitler, ‘forgetting’ to mention that the total vote for the Communist KPD and SPD in the last free elections in November 1932, was greater than that for the Nazis. ‘The administration of a few doses of castor oil to Communist adversaries.’ Perhaps in his visit he could have taken in the concentration camps of Dachau and Sachsenhausen. To Rothermere Hitler’s actions were to prevent Jewish ‘abuses’. They were of course entirely justified as there was in effect a Jewish conspiracy to take over the German Civil Service. What Rothermere omits to mention is the successive waves of legislation, beginning with the Law for the Restoration of the Professional Civil Service in April 1933 which de-Jewified the Civil Service (essay compare this with the Judaisation of the Galilee and other parts of Israel). ‘If the powers that be succeeded in overthrowing Nazism in Germany, what would follow? Not a Conservative-Socialist regime (SPD) nor a Liberal regime, but extreme Communism... A Communist Germany would be intimately more formidable than a Communist Russia.’ [Robert Black, p. 417, Fascism in Germany, pp. 296/297, Steyne Publications, 1975. The Aliens Bill in England and the movement which grew up around it were natural phenomenon which might have been foreseen.’ To the Zionists anti-Semitism was a ‘natural phenomenon’ which could not be fought and this of course explains the collaboration with anti-Semitism including the Nazis (especially in the 1933-1939 period). "The way stateless Jews from Germany are pouring in from every port of this country is becoming an outrage: the number of aliens entering the country through back door - a problem to which the Daily Mail has repeatedly pointed"
Indeed the Daily ‘Hate’ Mail did indeed warn of the Jewish peril. 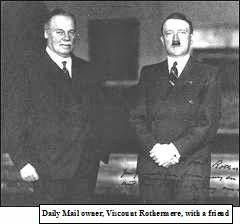 Throughout the 1930’s it and Lord Rothermere supported Hitler. In January 1934 appeared the famous ‘Hurrah for the Blackshirts’ article on the Mail’s front page. It was only after the BUF debacle at Olympia in July 1934 that the Mail began withdrawing its support. 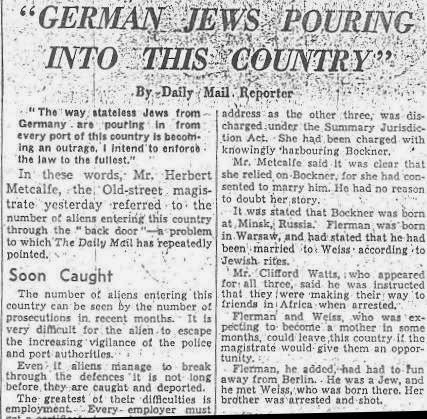 Daily Mail, 20 August 1938. Or go back further "They fought, they jostled to the foremost places at the gangways. When the Relief Committee passed by they hid their gold and fawned and whined in broken English asked for money for their train fare." Daily Mail, 3rd February 1900.